A little pop culture trivia for you involves the song Waterfalls by TLC. Do you remember how the chorus started? It started with, “Don’t go chasing waterfalls.” At Hutcheson Horticultural Company, we may be taking the song out of context, but we don’t want you to chase waterfalls either! 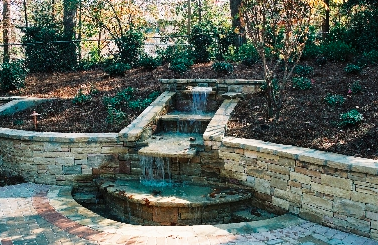 You can enjoy the beauty of a hardscaped custom designed and installed waterfall in your yard or place of business. Whether you are imagining Niagara Falls, or Amicalola Falls, think about the sounds and sights that are associated. Maybe you could describe crashing, splashing, trickling, and babbling for the sounds. What about the sights? Maybe clear, flowing, tranquil, peaceful, or natural? When our custom designers work with you, they can try to capture exactly the look you desire, and perhaps even the sound. Consider just how peaceful it would be with the addition of a waterfall in your backyard. Home and Garden Television state that, “The soothing sight and sound of bubbling water can add ambiance to your outdoor living space and mask unwanted noise.” We think that’s reason enough to look at the beautiful inspirational pictures they have to offer as you decide which type of waterfall you would like to install. After you decide, give us a call and we can help make your dram become a reality. Contact us today to get started on the custom design process with our Woodstock, GA hardscape waterfall experts.